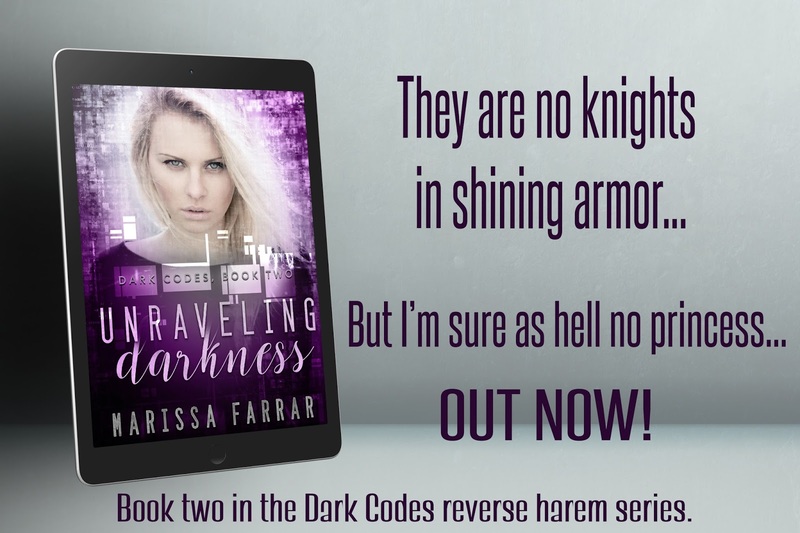 Marissa Farrar: Unraveling Darkness Release and Giveaway! Unraveling Darkness Release and Giveaway! The second book in my Reverse Harem series, Unraveling Darkness, released yesterday! To celebrate, I'm going to give away a signed paperback of Unraveling Darkness, plus a $10 Amazon gift card to one lucky winner! Just scroll to the bottom of this post and follow the instructions to enter. They are no knights in shining armor, but I’m sure as hell no princess. I belong to five men now. I gave them not only what was in my head, but also my body. Secluded in a cabin in the middle of nowhere, I’m learning more about what these men do to survive, and what I’ll need to do if I’m to survive with them. Though my instincts tell me to hunker down and enjoy the dangerous pleasures these men have to offer, my heart tells me we have to move. With my aunt in peril, a new mission takes me back home. But a turn of events allows me to delve deeper into the men’s secret world, and unravel the mystery that binds us together—the secret of what my father died trying to protect. Will we get what we came for, or will our combined foe threaten the safety of us all? And will the delights I find in the dark of night, still be with me when the day breaks? Book two in a brand new Reverse Harem series, with a dark romance twist. You can buy Unraveling Darkness, or book one, Hacking Darkness, from Amazon, or else you can read for free with Kindle Unlimited! Happy Holidays! Congrats on your book release! I look forward to reading this. Conratulations on release. I look forward to reading this it sounds like a great read. Looks like a great read. Thanks for the contest! Congrats! Looking forward to read the book! This sounds like a great read. Adding to my tbr pile. Thank you for the chance. Congratulations on the new release! It looks awesome! I need to check these books out for sure! Congratulations on your new release. Thanks for the chance! congrats on the new book! Thanks for the chance. Congratulations on your new release. It really sound great! Thanks for the chance to enter and congrats on the new release! Congratulations on the new release! And thanks for the giveaway! Congrats on release! Looks good! Thanks for chance! Congrats on the release! Sounds awesome! Can't wait to read it! So excited! Congratulations on the release. Looking forward to reading it. I am Happy for you about your new release. Hope to read it soon. Congratulations on your new release. Books sounds quite interesting. Congrats on your new release, looks like an awesome read!